Fig. 5. One of the stations along the trail to the mountain. Above, an orthostat is held in position by smaller stones. A bit lower, an oval flat space is surrounded by heaps of stones. Below that, a small, cleared space is delineated on both sides by large stones, and in the background is the access trail to the site where these photographs were taken. Beyond is the Paran Desert. 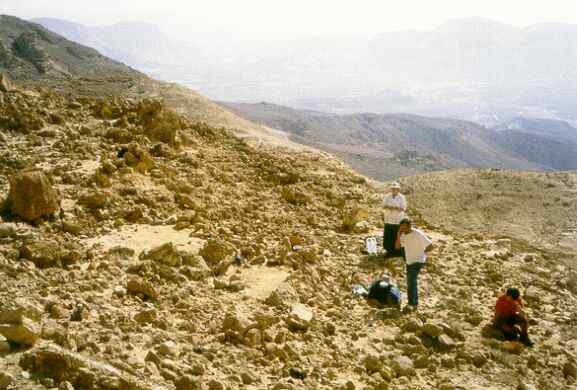 (Site HK 106d; photo EA99 XVIII-7; WARA W05869).